I was extremely excited to be able to test out a feature rich device like this heart rate monitor by BIOS. 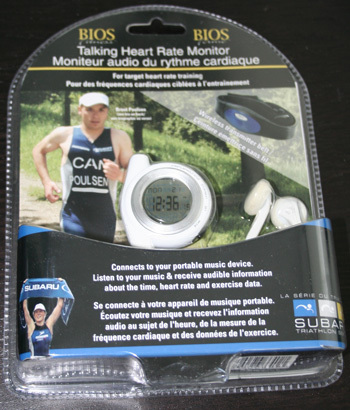 I had not heard of any other heart rate monitors (HRM) quite like this one. This device has an interval timer and heart rate monitoring function which allows you to listen to your IPOD or music device during exercise. When I received this package in the mail I was quite impressed at how small the actual unit was. I took it out of the packaging, wet the strip and strapped the HRM to my chest. Within seconds of strapping on the device I noticed a wireless heartbeat on the receiver. The receiver is the size of a watch and can be clipped to clothing, a backpack or a wrist band. After one month of extreme testing, I am happy to say that I have had a very pleasant experience with the BIOS FP402. The unit was dropped about 10 times and I did not notice any damage to it whatsoever. The main feature excelled during exercise while I was able to listen to my favourite workout music. your heart rate); Chrono (times your laps or times you for speed); and a Timer mode to countdown your workout. I really liked the ability to be able to monitor my heart rate during exercise. It has helped me achieve a lower bodyfat percentage because I am able to set goals that are easy to monitor every workout. 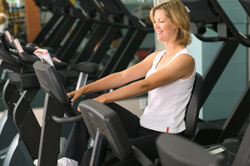 One of my goals was to stay between 150 and 175 beats per minute (BPM) for the entire 45-minute workout. This is not something I would recommend for the average person but I was able to challenge myself like never before. The overall functionality of the device excelled during exercise; I found the BIOS HRM easy to get to the functions I wanted when I needed them. What would I like to see for the next model of heart rate monitor by BIOS? 1. I would love to see a blue tooth enabled unit for connectivity to a cell phone, computer, or IPOD. It would be great to be able to find out what my heart rate is from my cell phone or smartphone. 2. A more graphical display may make it even more intuitive for the average athlete. 3. A function status message. Ie. I would like to know which function I am currently browsing within; I had difficulties at the beginning of receiving this unit trying to figure out how to jump between functions. If you are looking for more information about this product please visit their site here.